FILE - In this Aug. 17, 2018, file photo, family and friends who have lost loved ones to OxyContin and opioid overdoses leave pill bottles in protest outside the headquarters of Purdue Pharma, which is owned by the Sackler family, in Stamford, Conn. A new filing in a Massachusetts case ramps up the legal and financial pressure against the Sackler family, which owns the company that makes OxyContin. Photo via AP/Jessica Hill, File. 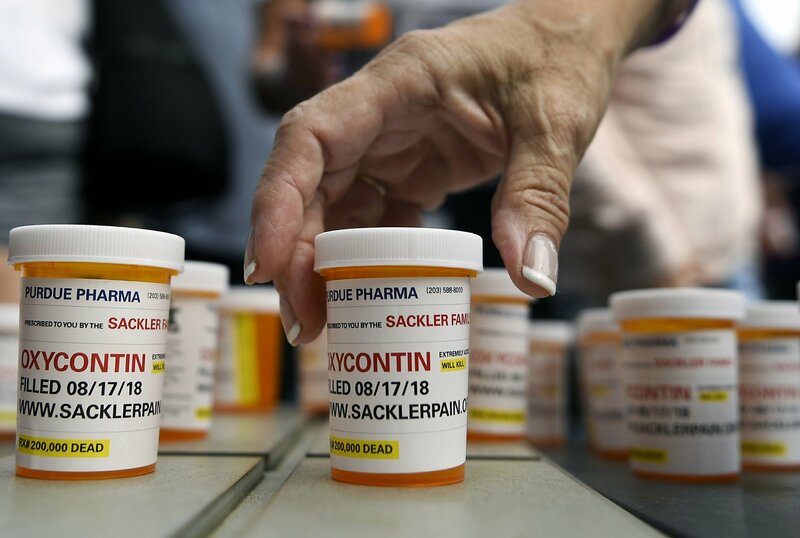 The Sackler family came under heavy scrutiny this week when a legal filing in a Massachusetts case asserted that family members and company executives sought to push prescriptions of the drug and downplay its risks. Those revelations are likely to be a preview of the claims in a series of expanding legal challenges. Members of the family that controls Connecticut-based Purdue Pharma are also defendants in a lawsuit brought by New York’s Suffolk County. Few, if any, other governments have sued the family so far. But Paul Hanly, a lawyer representing the county, said he expects to add the Sacklers to other opioid suits. He explained last year that he was targeting the family, known for its donations to some of the world’s great museums and universities, in part because they took “tens of billions” of dollars out of Purdue Pharma.